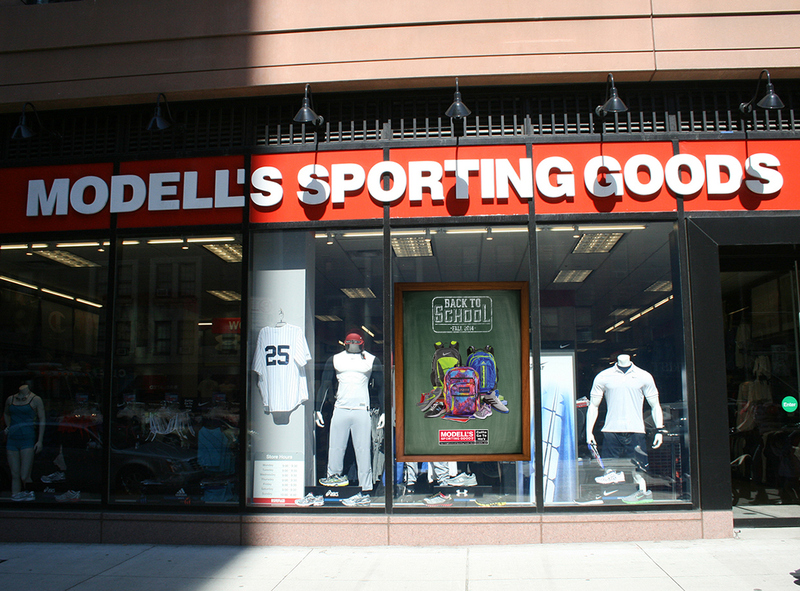 The Back To School direct mail campaign for Modell's Sporting Goods. 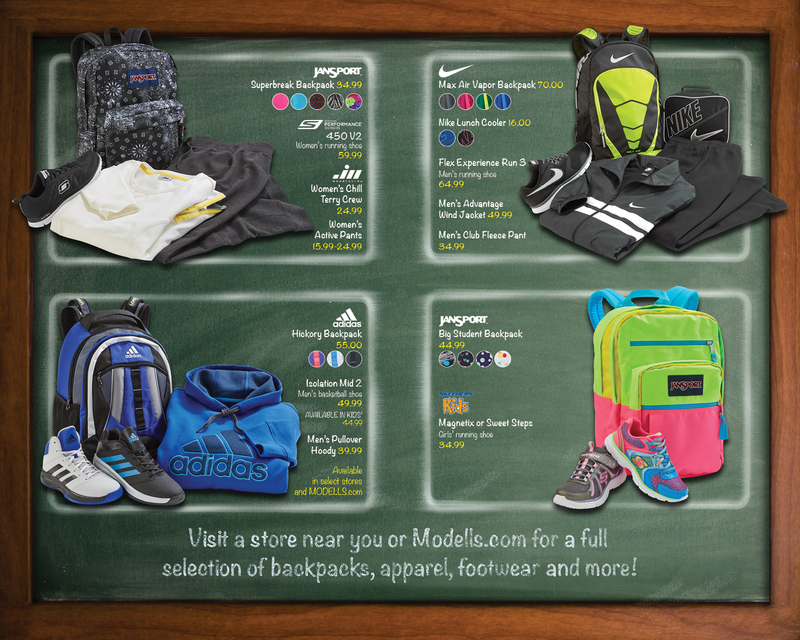 For Modell's 2014 Back To School direct mail double postcard, we chose to riff off the 2013 BTS graphics and reuse the chalkboard motif, but freshen it up with a BTS branded look and feel that would play out to POP, e-mail and web. After working with the buyers and merchandisers at Modell's, Jason VanBlaricum, his stylist Angie and I worked on creating BTS outfits for the family, featuring footwaer, apparel and our kety BTS item, backpacks! After the principle photography was completed, I created the BTS logo lock up and art directed our senior designer Peter Ahn and summer design intern Jenny Mauric as they worked on this fun four panel postcard. We were able to tell brand stories, highlighting our assortment and telling a true BTS story. To carry through the campaign, the identity, photography and graphics were repurposed for in-store POP. Window banners, entrance banners, snap frames (over the BTS and backpack section) and t-frame/4-way toppers. The graphics were reused as part of the circular, ROP and digital promotional campaigns. 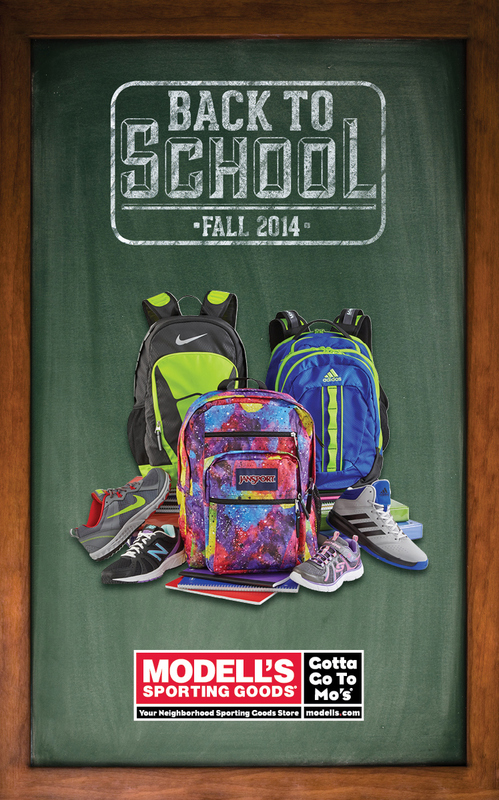 A very cohesive presentation for the back to school shopping period.